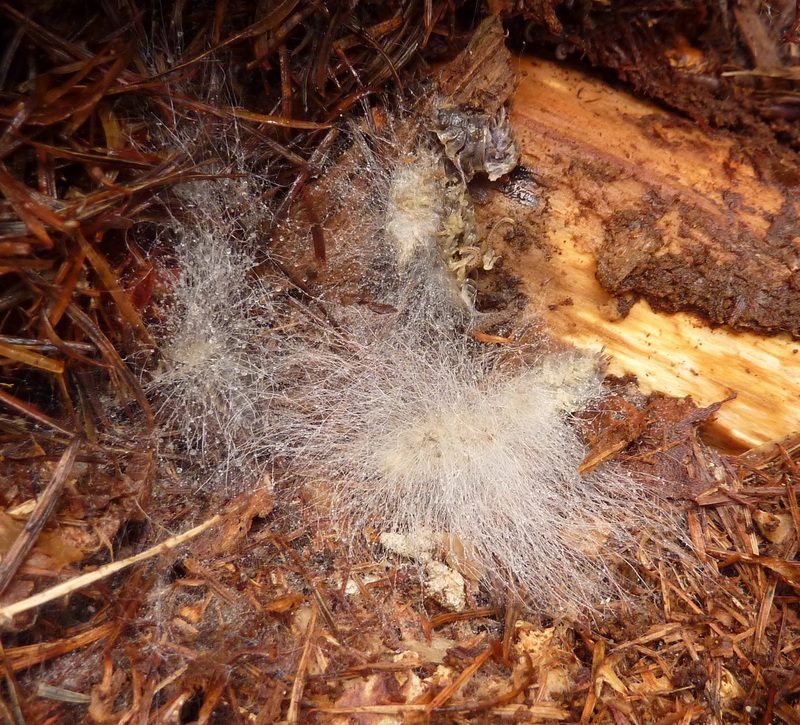 No surprise, a forest is filled with dead wood, cut branches, fallen trunks or roots. But do you know that these pieces of dead wood actually play a big role in the forest ecosystem? They serve as food, shelter, nests, camouflage for a wide range of creatures. 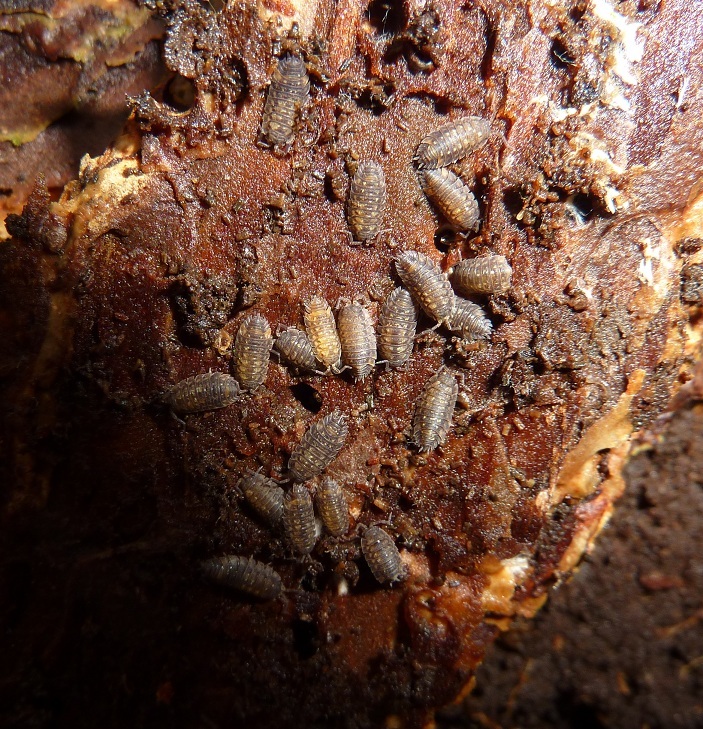 The most obvious inhabitant of these damp places is of course the woodlouse. Often found in large numbers like these Oniscus asellus, it’s a crustacean which feeds mostly on decomposing plant matter. Some of the woodlice have a special ability! 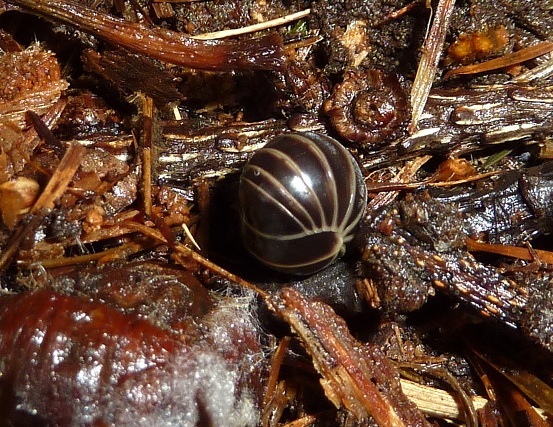 Armadillidium vulgare, for example can roll up into a ball as a defense position. (Sorry, I waited around 10 min., but it did not want to get back into his normal shape :D). 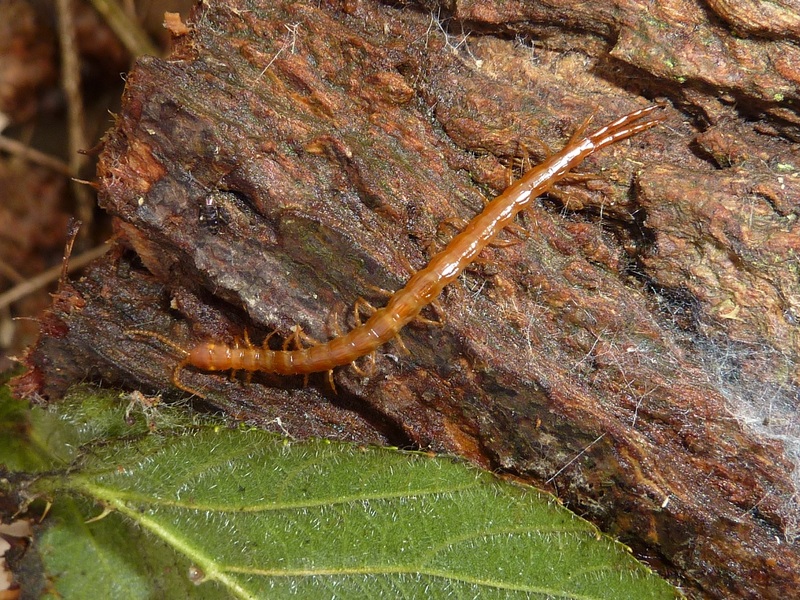 Then come millipedes (aka Diplopoda, if you want to sound clever) : Proteroiulus fuscus (the common snake millipede, with little red spots), and maybe Tachypodoiulus niger (black body and white legs). 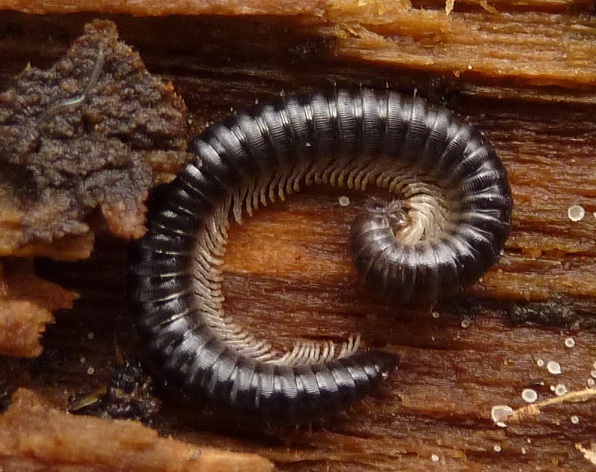 Millipedes are usually slow walkers, they eat plants and decaying matter. 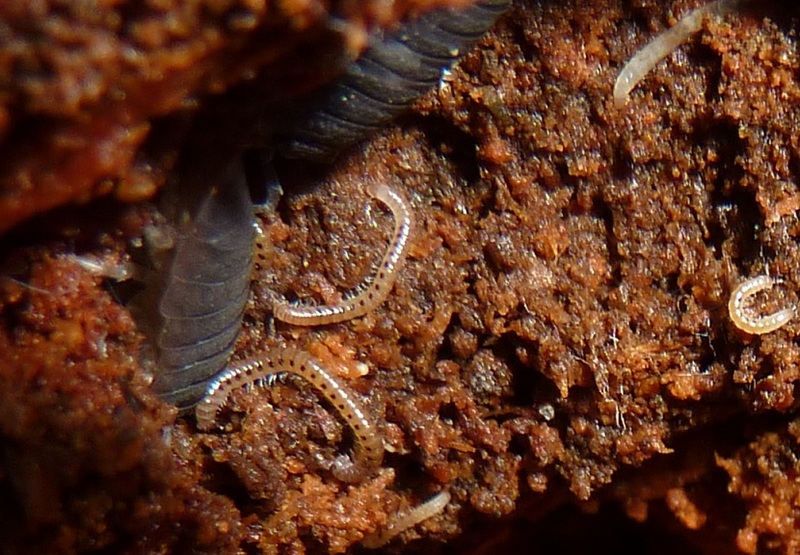 Dead wood, if wet enough, can also serve as home to larvae. This one looks like a leech, and actually got me confused. It’s in fact a Diptera larva (Tipula sp.). Other forest worms are Nematoda (round worms) and Nematomorpha (the Gordian worms, who can reach up to 2m and are pretty…impressive. Hope I can show you one later in the year!). 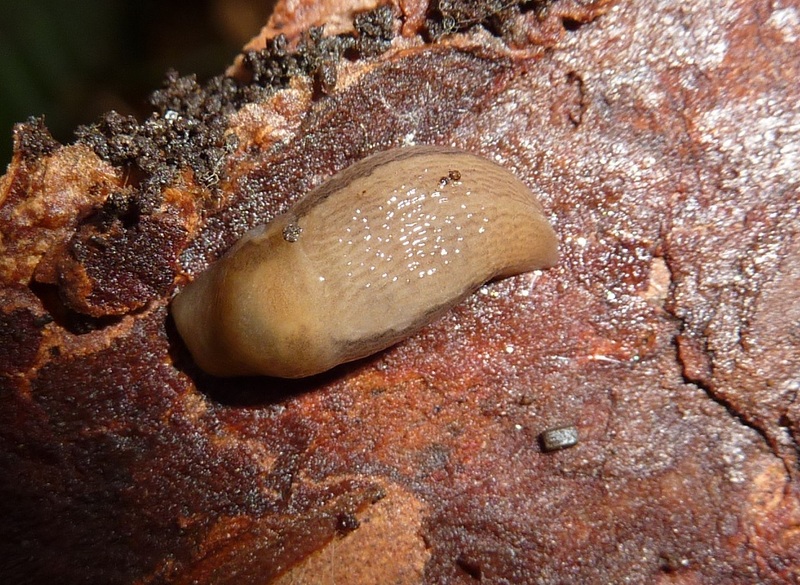 Molluscs include snails and slugs. 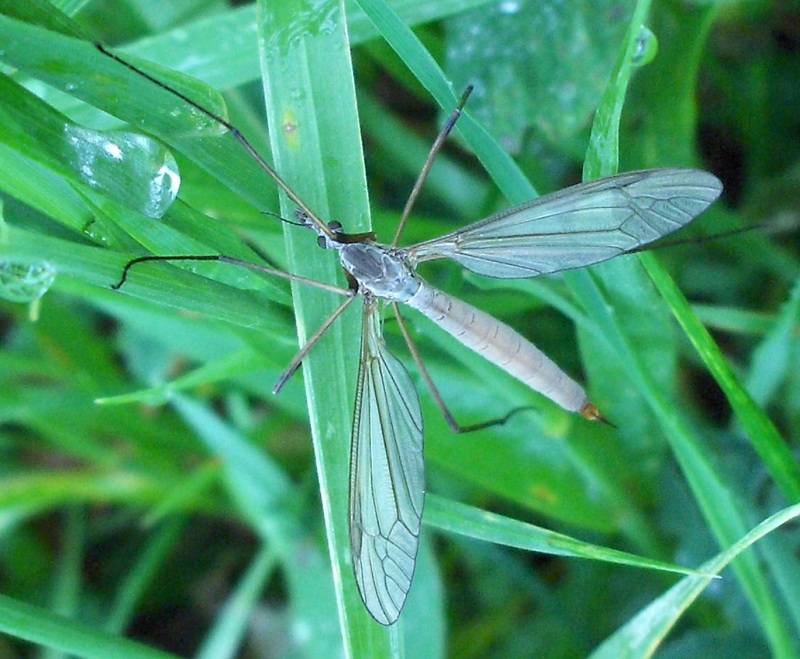 True insects can be Diptera, Coleoptera or even Hymenoptera. 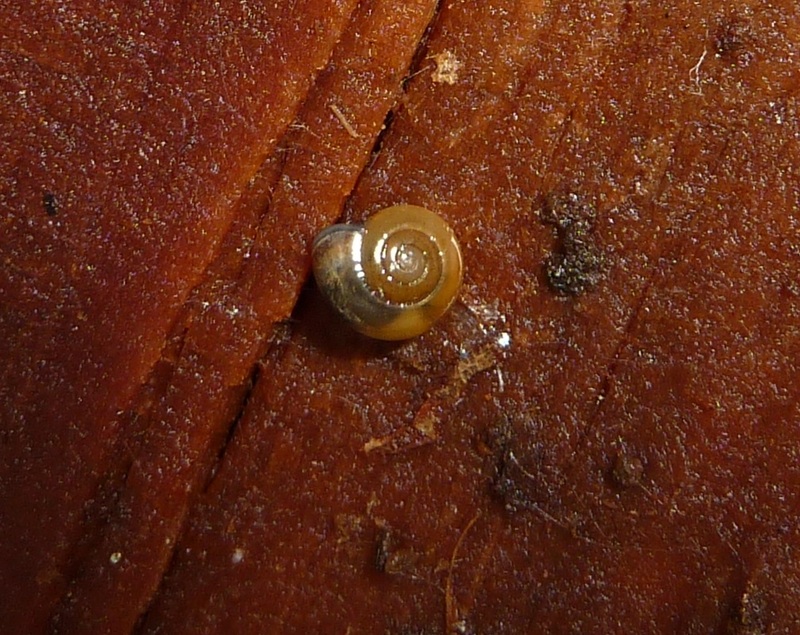 Many larvae live in dead (or sometimes alive) wood., but adults can also be observed, especially in the winter. 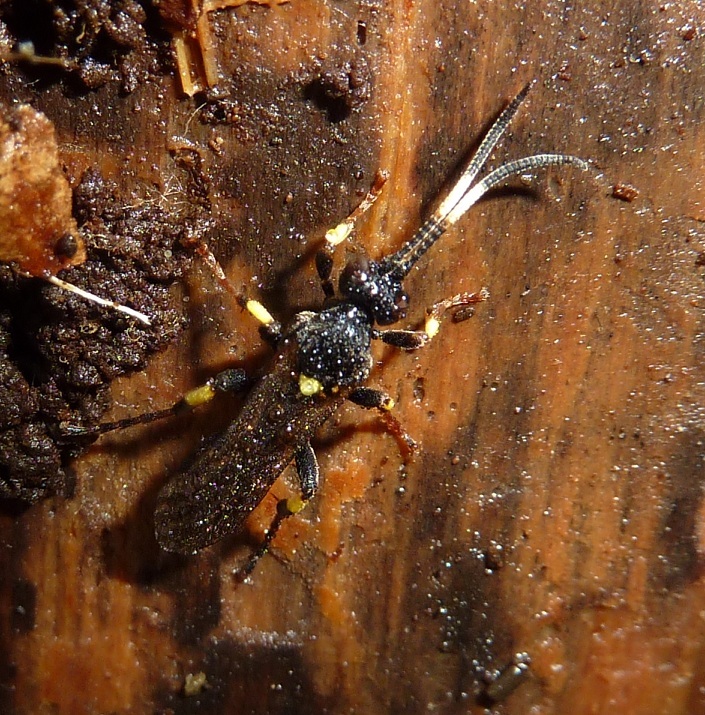 Today, I found this pretty wasp under the bark of a fallen tree. It’s probably Ichneumon stramentor, a parasite of moth caterpillars (the adult wasp lays its eggs inside the caterpillar, the developing larva eats the inside of the caterpillar..Bon appétit!). 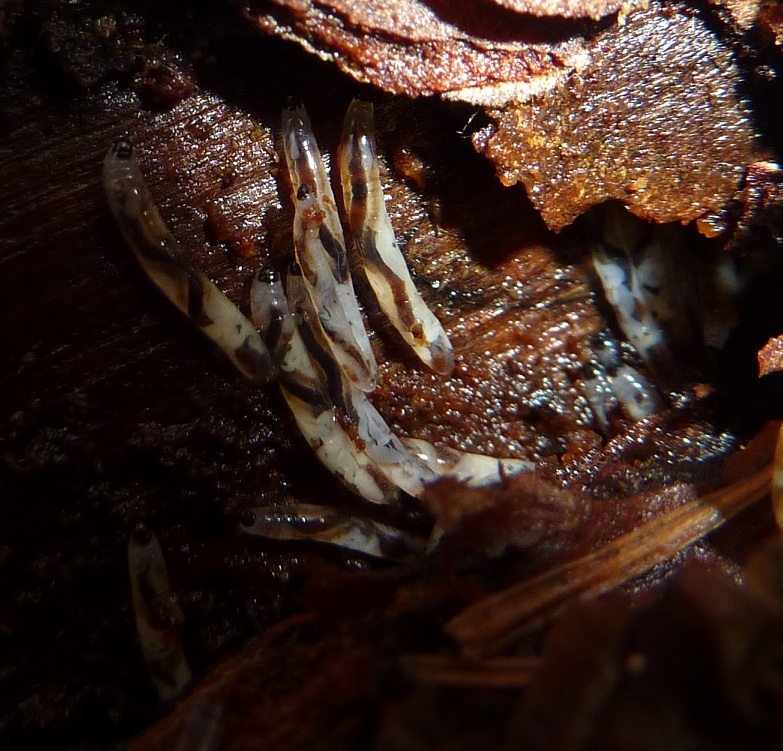 I also stumbled on these bizarre worms or larvae with brownish lines over their body. Maybe there are parasitized? I have to check this! CHECKED : no parasitism here. These are fly larvaes of the family Sciaridae, and the brown lines are their…digestive tubes! Previous Post Un champignon rose? This is the first of your posts that I have read. I look forward to exploring your site further. Thanks for following my blog. I hope I am able to come up with subjects that will be of interest to you.